Peerless Aire humidifier filters, made with honeycomb filtration, traps minerals in the water entering your humidifier to keep them out of your home's indoor air. This Peerless Aire 31002 Replacement Evaporator Pad provides effective absorption of more water for increased humidity output. 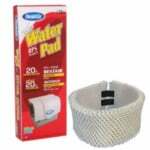 This Peerless Aire 31002 Evaporator pad also helps fight impurities such as mold and fungus spores.